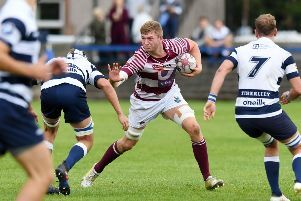 Former Edinburgh Rugby Elite Development Player Phil Cringle, who quit the Capital outfit last summer, will play his rugby in France for at least one more year after signing a contract extension with US Carcassonne. He has been involved from the bench on three occasions for the top side which has been battling to remain in the second tier ProD2 and is now safe. Meanwhile, another ex-Edinburgh man, Nick De Luca, confirmed that he is back to full fitness when he scored one of Biarritz Olympique’s four tries in a 26-17 win over Montauban in ProD2. De Luca had been out of action since February because of a broken hand sustained in the match away to Agen but is now set to play a part in the Basque club’s promotion bid.